The Opera House is located in Circular Quay which is a great place to chill and grab a cocktail. The Opera Bar serves famously fancy cocktails that make you feel like your on the set of Gossip Girl—but watch out for the seagulls (they are a little extra). Right in the same area is an amazing contemporary art museum. Most of the artwork is inspired by Asian and Aboriginal culture. The best part about this museum is that they have a rooftop cafe that is the perfect spot to grab a cup—or gallon—of coffee to get you through the rest of the day. Before you head home for the day, take a walk along the Royal Botanic Gardens. You can take a short walk or spend an hour walking to a nearby beach for a quick dip in the Pacific. The trees in this garden are outrageous and make for a great picnicking spot. Because we only had 2 days in the city, we had to pack a lot in. The second day, though locals said we couldn’t do it, we wanted to see the famous Blue Mountains, and the Sydney Zoo (because I mean come on…kangaroos!) all in the same day. The Blue Mountains are an hour train ride into the outskirts of Sydney, tucked away in this cute little mountain village. We decided to take this double decker tour bus that would drop you off at each of the National Park sites. The bus starts the tours at 8am and runs until 5pm, so If you can, get there early so you don’t miss anything! Since we had limited time, we decided to choose three spots to spend our time on—(the Three Sisters, the famous Hot Chocolate Cafe, and the Scenic Railway). I would recommend doing this bus tour because all of these excursions cost money, and not all of them are in walking distance, so it was way more convenient to drop a few dollars on this all-inclusive ticket. This is the Three Sisters. Around it are several walking trails with various levels of intensity. We chose the 10 minute walk and it was easy, we had a great view, and the entire walk was absolutely gorgeous! When they tell you this is the best hot chocolate in the world, you need to believe them…because this is the most literal form of hot chocolate. The ladies that own Blue Mountains Chocolate Company melt their homemade chocolate, mix it with steamed milk, and bring it straight to your table! Our last stop in the Blue Mountains was the Scenic Skyway. This all see-through, glass cable car glides back and forth between the Three Sisters and Jamison Valley and gives you the best view of the major sites of the Blue Mountains. Unfortunately, the best time to visit the Taronga Sydney Zoo is when it is warm outside, but it didn’t stop us from seeing those sweet koalas! 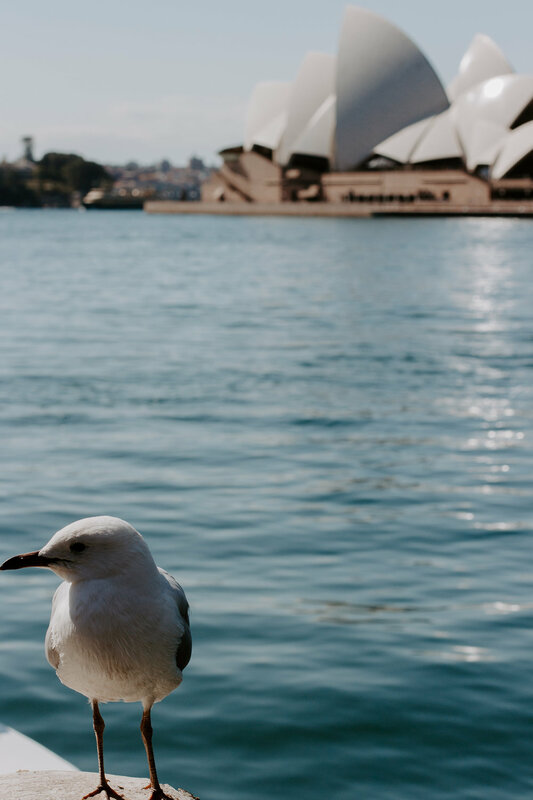 The best (and cheapest) way to get to the Zoo is to buy a ticket at Circular Quay that includes the ferry boat ticket as well. The ferry gives you one of the best views of the harbor and only takes about 20 minutes. The Zoo is shaped sort of like a slanted pin-ball machine, so they take you on a a ski-lift to the top, and you basically just work your way back down to the entrance. The map was a little confusing, so just accept the fact that you’ll need to ask people where to go haha. 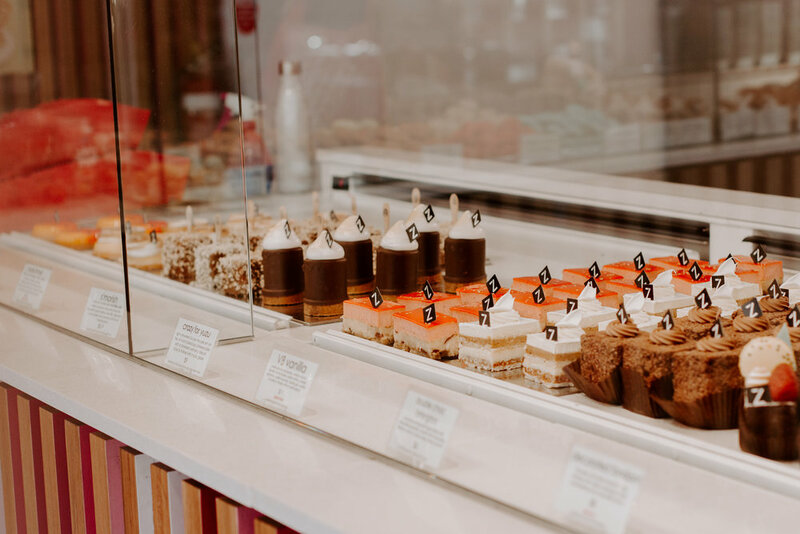 Zumbo’s Patisserie is so dreamy and fun! Our favorite dessert was the Lemon Tart, but everything looks and tastes delish! No. 12 Vintage Coffee Shop: We started and ended our trip at this quaint little coffee shop within walking distance from our AirB&B. The owner was so nice and fun, and she gave us a lot of ideas for our short stay in Sydney. This was my favorite spot for cool gifts to bring to friends because everything was vintage or handmade! our favorite sip was the Turmeric Latte—and be sure to grab a ham and cheese croissant on your way out! Four Frogs Creperie: French food (check)—delicious Rosé (check)—modern & minimalistic atmosphere (check)! This little spot was vibrant and so fun! The crepes were bigger than my face, yet we each ate one savory one for dinner and split a sweet one for dessert ;) We splurged and got the seasonal dessert crepe—so when you go, trust their recommendations—because we LOVED everything we tried here. Inner City Self Contained 1br Unit—Kensington: This AirBnB was EVERYTHING. The location was PERFECT. Were we able to walk to get coffee in the morning, then head on a bus, and within 10 minutes we were in the city center. While we were in Sydney we used public transportation to get everywhere. Our hosts were kind enough to have public transport passes already loaded and ready for us when we got there, which made life so much easier for us! The owners are some of the kindest people we have ever met. This apartment is tucked in right behind their home, but with just enough privacy so you don’t feel like you are encroaching on their lives. They gave us maps, guides, and helpful tips on navigating the city—they even gave us authentic Vegemite Toast to try:) With two people, we had more than enough space in this little studio apartment. It had a great kitchenette, a spacious bathroom, and a perfect little lounge area!